I'm making a table runner for my daughter. I need an some opinions. Its a wrought iron, glass top, round, casual kitchen table. Its 48" across. What length would be best for the runner? Overhang on each end? No overhang? How long? Thanks! I think of overhang for a more formal setting. Overhang gets in the way if left on table during use. And at least in my house casual eating area gets a lot more use than formal dining. Kids, cats and dogs always figure into my decision about overhang. Terry Atchison has a cool hexagon, too. Overhang sounds like a poor plan in this case. Hexagon sounds good. may you be in heaven before the devil knows your dead! Hexagon would be a great shape....even square would be better than rectangular on the table. Another possibility would be a round one, but that could be more difficult to make. Strata Star would be great on a round table.
. Very quick easy and it can be done with 10' wedge if you don't have 9' . Thanks everyone, you've given me some great ideas! I have a round table and don't like a "runner". Would much rather have a topper and hexagon is perfect! I have a round table in an informal dining area. 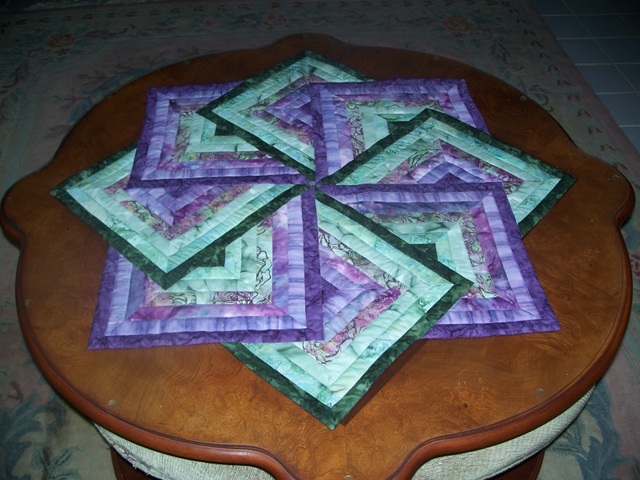 I use quilts on it for table cloths all the time. When they get dirty I wash them. Granted I don't have small children and wouldn't do this with children. I use square quilt and often will round off the corners and/or scallop the edges to give it a more pleasing appearance on a round table. I like the weight of the quilted cloth as it drapes nicely and stays put. Lots of different patterns work and you can adjust the size by the size of the border. On a round table, a runner that hangs over the edges will not lay flat against the sides of the table. I vote for a round or hexagon shaped runner. I have only round tables and often put a square in the middle of it. Love the look. I agree that a runner that overhangs the edge wouldn't lay flat, so would rule that out. I don't think an overhang on a round table would work very well because of the curve. No overhang. I would choose a hexagon or round runner. I would do a Swirling Stars - Card Trick table topper (free pattern). Here's one of mine (I've done 4). I love to make table runners, but I do not make them with an overhang. Simple because I hope they use them daily and the overhang looks too formal to me. I would say "no" to an overhang. OCtagon (eight-sided) might be another shape to consider. A short and fitted overhang (think fitted bed sham) could be really useful and could not slide off. Could be really tricky to make though. Otherwise no overhang! Dolly, love that table topper! Where do I find the free pattern, please? Me to. Love it and the colors.